Backstory - James K. Abshire, M.D. As a practicing physician with over twenty-five years’ experience, Doctor James Abshire has seen patients struggle with death – either their own or that of a loved one. He felt the call to assist them in ways that can’t be done with an office visit and thus he began writing this for them. Two years into this project, he was given his own diagnosis of terminal cancer, which gave him added insight. 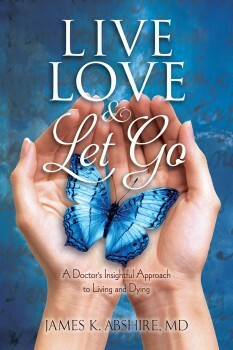 Dr. Abshire spent many hours researching, interviewing, recording testimonials and writing Live, Love and Let Go: A Physician’s Approach to Living and Dying. All of us at some point will be confronted with the issues of death and the dying process. As a physician, he has had the unique opportunity to console and counsel many patients and their families on the immense medical, financial and emotional issues which are encountered in this phase of life. This book will provide tools to make positive informed choices, as well as develop a positive, practical and spiritual approach to the most difficult phase of life.